"No more competing claims for food versus fuel: put both rice production and power on the same paddy." Somewhere between three and four billion years ago, algae first appeared. This may not sound exciting, but it paved the way for life on earth and could ultimately point to part of the solution to today’s energy crisis. Algae, along with other early organisms like cyaonobacteria, is photosynthetic. This means that it’s able to capture carbon and breath out oxygen in return. And we need oxygen to breathe. During the following billions of years, more photosynthetic organisms developed: plants. The interesting thing about plants is that they convert CO2 into chemical energy - glucose - and produce water and oxygen. So basically plants do what we’re struggling to achieve, in a world threatened by climate change: they capture CO2, produce energy and keep our air clean and breathable. So why can’t we do the same thing? Well, we can’t “do” photosynthesis, but we can use it. At Wageningen University in the Netherlands, a crazy assistant professor, Bert Hamelers, thought that it should be possible to produce electricity from living plants, without harvesting them. He hired a Postdoc to do an experiment and he succeeded. They wrote a research proposal and hired a PhD-student to do more work on it: me. I didn’t want to be in academia (who wants to be in a lab all day?) but not knowing what to do otherwise I ended up doing a PhD. Basically, my professor lured me into it by telling me that a spin-off company should be created from the research project, and he thought I would be fit to lead it. After just one month, I knew that I’d made the best decision of my life. 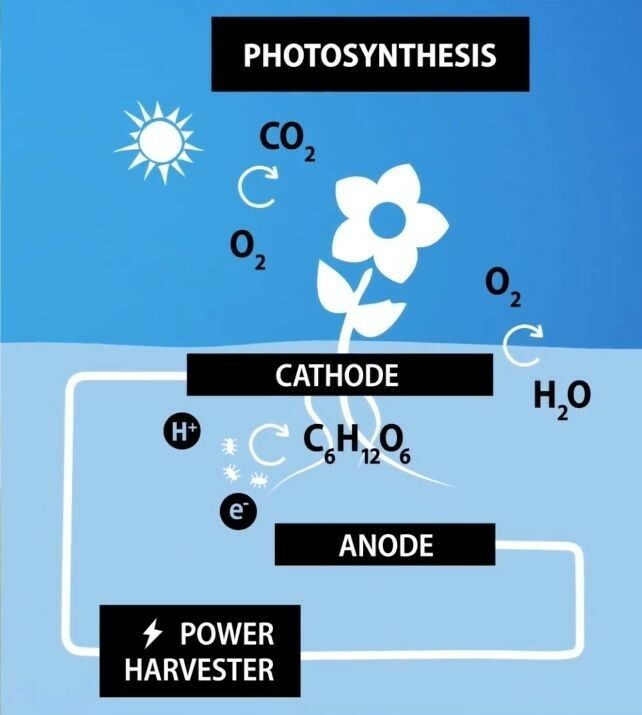 So how do you produce electricity with living plants? Simply by using the natural processes that already occur. In short: the plant produces organic matter via photosynthesis. Only part of this organic matter is then used for its own growth. The rest is excreted via the roots. Around the roots, bacteria feed on the organic matter and they release electrons. If you’re able to harvest the electrons into an electrode, you can couple the first electrode to a counter-electrode and build an electrical circuit, like in a battery. The electrons flow back into the natural system via the counter-electrode, so it’s completely circular. Because we use the natural processes around the plant, nature is not harmed. It works day and night, summer and winter. It only stops when the plant and its surroundings completely dry up or freeze over. So wetlands would be the ultimate source of electricity. Probably the best thing about this technology is that it can be combined with existing applications for the same land. No more competing claims for food versus fuel: put both rice production and power on the same paddy. During my PhD, I worked on improving the power output from plants in the lab. At the same time I started a spin-off company, Plant-e, together with my colleague David Strik, to find applications for the technology. When I graduated in 2012 we launched the first product: a turning globe fuelled by the electricity from a plant. Unfortunately, at that time we couldn’t get the product produced so our first market entry failed. But we were able to attract some financing, so we hired some smart young people and worked on the next product. In 2014 the first product was launched successfully: a modular system. Basically we sell planters with plants and wires that can be connected to LED lights, for example. This is not going to replace coal-fired power plants, but it’s a start. This is the first step towards using what nature has developed over billions of years, without interfering with nature. The modular system can be used to set up small, self-powered sites in cities, but it is not scalable. So a new system is under development. This new system is a tube, which contains both electrodes and can be drilled horizontally in the root-zone of the plants. This way existing plants can be used to produce electricity and any wetland would ultimately be able to produce electricity. After wind, solar and hydropower, the full range of biomass sources are now ready for energy production. Our energy revolution has already started. We go from large scale to decentralized energy production, and we start to realize that no one individual source is going to save us. It’s going to be the full range of alternative, renewable and sustainable technologies that are slowly replacing fossil fuels. I don’t think that one small company of five people in Wageningen, the Netherlands, is going to revolutionize our energy production. But I do want to be part of it. Author: Marjolein Helder is the CEO of Plant-e, a World Economic Forum Technology Pioneer. She is participating in the World Economic Forum’s Annual Meeting in Davos.